Lionel Maintenance of Way MOW Command Control Trackside Crane. Offered for the first time as a gantry unit, this Scale sized trackside crane provides the highest level of loading and unloading action to your layout. Equipped with Command Control you can lower and raise the boom and hook lines, rotate the cab 360 degrees, and activate lighting all from your CAB remote controller. 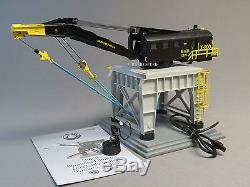 Add the separate-sale Crane Sounds Work House to add realistic crane sounds to your loading and unloading operations! Legacy Control System-equipped operation including. Up and down action of boom arm. Independent control of the main and auxiliary hooks. Independent control of crane lights. CAB-2, CAB-1L, or CAB-1 remote control required. Die-cast metal cab body, frame, and boom. 7 ¼" x 7 ¼". 2016 Lionel Volume 2 Catalog. The item "LIONEL MOW COMMAND CONTROLLED TRACKSIDE CRANE O GAUGE train gantry 6-82033 NEW" is in sale since Friday, December 30, 2016. This item is in the category "Toys & Hobbies\Model Railroads & Trains\O Scale\Other O Scale".